CK Golf | We help golf course owners and operators make more money! CK Golf – We help golf course owners and operators make more money! ANYTHING GOLF. ALWAYS ON TARGET. We are not consultants. We are your business partners. 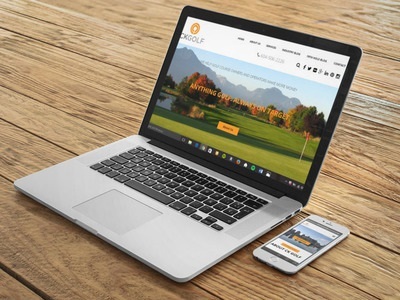 We believe in a hands on approach to helping your golf course generate more revenue. We will not provide you with just some written advice on what to do, we will get involved, get dirty and help you make things happen. We also understand the need for accountability and can provide easy to understand reports and metrics for each stage of any of our projects. We will work with you to grow your sales and revenue using best practices, internet marketing and developing a strategic business plan. We can help get your operation on track. We are not afraid of change (in fact we embrace it) and we can help you get new and exciting programs off the ground. Convert your internet marketing efforts into more customers and more money! Read about our email and social platform services. Call 604-506-2226 to customize a package today! Prior to the launch of CK Golf Tara had previous experience as a Sales Manager, Marketing Manager and a Tournament Coordinator. Tara’s strengths include analysis and reporting, development and execution of marketing plans, content creation, customer feedback, data collection and project leadership. Tara enjoys getting to know our clients and working closely with them to understand all aspects of their business. She is also our team’s travel planner. Prior to the launch of CK Golf Jeff had previous experience as both a General Manager/ Director of Golf and a Head Golf Professional. His experience and expertise lie in the areas of business analysis, strategic planning, sales strategies and golf course internet marketing. Jeff is a Past President of the PGA of British Columbia. He has been a finalist for the PGA of BC Head Professional of the Year award and two time winner of the National Golf Course Owners Association – BC Chapter Four Seasons Golf Professional of the Year Award. Jeff is a regular speaker at golf and other business conferences on Internet Marketing to Grow Revenue, Social Media and a variety of other topics focusing on best practices. Stacey has been working in golf course marketing for 3 years and is a regular and long time user of social media platforms and has volunteered to help non-profits build their social presence and manage WordPress websites. Stacey has 10 years of previous retail management experience and is currently helping businesses grow by using social media. She is the mom of 3 busy boys who are all up and coming golfers! Finally, a company that understands and can utilize social media on our behalf. Cascadia Events has been trying for years to find the right partners to assist with social media – CK Golf is that company. I have also found Jeff & Tara to ask great questions to get me to think about what it is I am really trying to accomplish with all my media. Then on top of that – they take a lead in making it happen. Generate More Revenue! Get our tips on how to use your tools more effectively and generate more revenue. Plus stay up to date on golf industry trends and the latest internet marketing buzz. Are you using Google My Business yet? We can help you get started and teach you how to use this FREE tool effectively to grow your business!